Put down your tennis racquet and come play in the dirt. Hiking is one of, if not the largest outdoor activity, in the United States, but why do so many people want to walk on dirt? Some reasons might be that hiking appeals to all ages and cultures, refreshes the soul, is accessible and is intertwined with other outdoor activities. Hiking's popularity can be partially attributed to its appeal to a broad range of ages, from the young to 80-plus and of all walks of life and cultures. It is a sport that can be started before children learn to walk by papoosing on their parents back and is often easier on the body than other outdoor activities allowing hikers to continue their hiking careers well into retirement. Most of the hikers I know who are in the age range of 70-plus can “kick my tail” on the trail, because retirement allows these human mountain goats abundant time to hike. Hiking also is a family-style activity that allows different age groups and cultures to mingle socially on the trail and supposed age barriers drop away. Many times over I have seen supportive family-style friendships develop on the trail with age gaps of more than 20 years. Hiking allows all ages and cultures to connect and experience nature. The lasting value of time spent in the outdoors is the topic of a book that is receiving attention from experts: “Last Child in the Woods” by Richard Louv. The book focuses on children and the importance of the unexplainable magic and benefit of time spent outdoors. This “outdoor magic” is also applicable to adults. Accessibility also plays into the popularity of hiking. Many trails are within an hour or less locally and across the United States. Hiking is intertwined with running, biking, kayaking, rock-climbing, etc.… because these enthusiasts must often cross terra firma to participate in their sport. The love of hiking unifies assorted groups and ages creating a stimulating outdoor social environment. 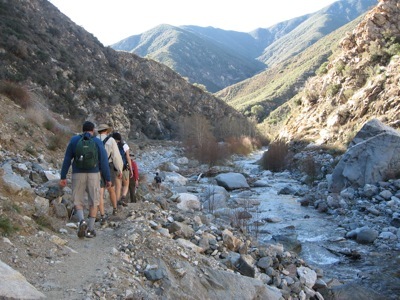 If you would like to trade-in your tennis racquet for hiking boots to experience the magic of social hiking, go to OC-Hiking.com. The Orange County club is free to join and offers information on local hikes all over the county and beyond. The OC Hiking Club's goal is to get men, women and children out into the outdoors through social hiking, backpacking and group outdoor activities. Donations to the club support a variety of activities and help defray administrative costs, Web site maintenance and the MileMarker newsletter. To donate to the club, go to: oc-hiking.com/donations. Suki Reed is the president of the OC-Hiking Club.